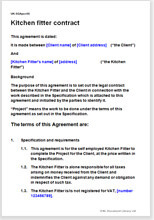 Simple form of contract for a kitchen fitter working (labour only) in the home or office of client. You may work in your own name or through your company. Main purpose of contract is as a disclaimer of liability for your work and to set the terms for avoiding conflict. The document includes very full explanation and forms to cover the Consumer Contracts (ICAC) Regulations. Just add a specification for the supply and fitting of units and you have a contract suitable for any private client. This contract covers just those areas where you most need legal strength: limiting your liability if things go wrong, cash collection, payment for extras, no posting on social networks. Of course, with the wide Net Lawman experience of the real world, there are a few more helpful points too. If you have not arranged for up front payment you are always at risk that your client will not pay. We give you the option of several alternative payment procedures from all up front to all on credit. Limitation of liability features large in this contract. Helps to protect you from a client who thinks he is too clever. Most importantly, it provides the simplest way to deal with the Consumer Contracts (Information, Cancellation and Additional Charges) Regulations 2013. "Easy to find use. Plain English. Good precedent."